He has come down through history as America’s firsts serial killer, the incarnation of pure evil. He was the first of a new breed of American celebrity – the handsome, debonair and super intelligent mass murderer. His legend, fueled by his own insatiable appetite for exaggeration, would turn him into a monster, ‘the arch-fiend of the age’ and the ‘greatest criminal of this expiring century’. His Murder Castle, situated at the heart of the world’s greatest exhibition, was reputedly the scene of unspeakable horrors. 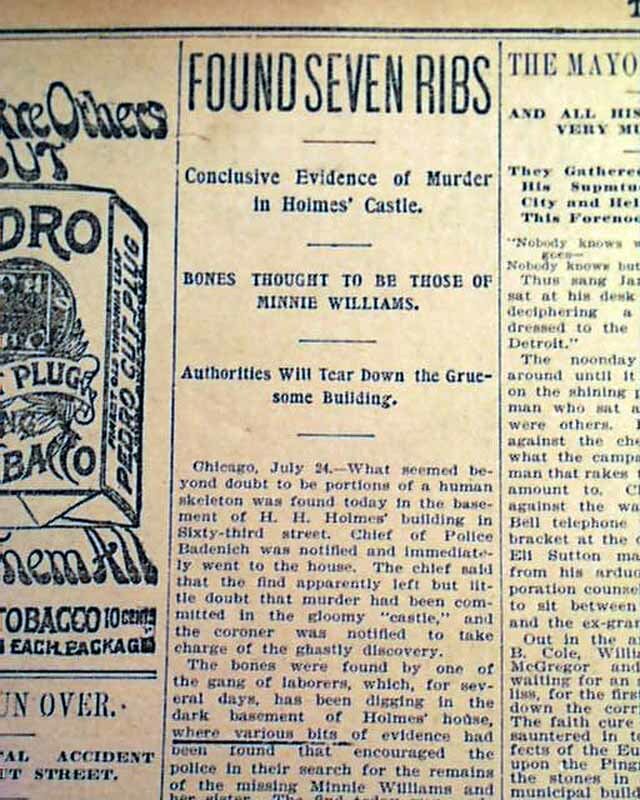 Yet, the truth about Dr. H. H Holmes is far removed from the sensationalism that surrounds his name. No one did more to turn the gossip into legend than Holmes himself, which makes it all the more difficult to get to the truth about the Devil in the White City. The man who would come to call himself Henry Howard Holmes was born with the far less impressive name of Herman Webster Mudget on May 16, 1861 in Gilmanton, New Hampshire. By all accounts his parents were upright and respectable people, with the child’s upbringing being quite unremarkable. Later stories that his father was a violent alcoholic who would smother his children with chloroform soaked handkerchiefs to ‘teach them a lesson’ are the result of some newspaper writer’s overactive imagination. Yet, there is one incident in Herman’s youth which clearly did have a profound impact on his later life. When he was about 13, two older boys dragged him into the local doctor’s office – a place that Herman was terrified of due to the lurid tales he’d been told of the body parts that were left lying around. The bullies brought the terrified boy face to face with a human skeleton. But rather than frightening him, the human bones fascinated the child. This fascination grew into an adult desire to study medicine. Holmes had another early fascination – with women. By the age of sixteen he was working odd jobs when he fell head over heels in love with a beautiful young woman by the name of Clara Lovering. Herman met Clara while working on her father’s farm. Soon after, they were both at a church social. Clara, though, was flirting with another boy which made young Herman see red. He promptly marched over to the other boy and threatened to punch his lights out if he didn’t get lost. This seemed to impress Clara, with Herman escorting her home, arm in arm. The next day he was telling everyone that they were engaged. They two – both seventeen years of age – were married by a Justice of the Peace on July 4th, 1878. For the first six months the marriage was kept a secret, with the couple living apart with their parents. When it was finally revealed, Herman’s mother wryly commented . . .
She couldn’t have done much worse and will probably have to support you. Clara’s father arranged for Herman to work in his brother’s grocery store in East Concord. Nine months later, Clara gave birth to a son, who they named Robert. Becoming a father seems to have inspired Herman to pursue his interest in medicine. He quit the store and went home to Gilmanton to take up an apprenticeship under Dr. Wight, the owner of the office in which he’d been introduced to the skeleton 6 years earlier. Clara and the baby went to live with her parents. After a year, the budding medic took up more formal studies at the medical school in Burlington, Vermont. During this time, he conducted himself as a single man. In fact, he carried on a relationship with the daughter of his landlord that became so passionate that people thought they were engaged. When Herman’s room-mate, Fred Ingalls, revealed to the girl’s father that he was already married, the two timer laid a thrashing on Ingalls that left him with a black eye and a scratched face. The wife of the owner of the boarding house once noticed a foul stench emanating from Herman’s room. On investigating, she was horrified to find a dead baby under his bed. Upon explaining that he was experimenting with dissections as part of his ‘homework’, Herman was warned to never bring dead bodies into the house again. In 1882, Herman went to Ann Arbor to study at the University of Michigan. This time he took his wife and son with him. But the marriage was already on shaky ground. Other residents of the boarding house where they lived later recalled that the couple often quarreled, with Clara frequently sporting black eyes. At some point she decided that she’d had enough, returning home to her parents with baby Robert. The marriage was now effectively over though this would never be formalized. Now unfettered by a family, Herman threw himself into his studies. He was particularly fascinated with the dissection of human bodies, loving nothing more than to cut his way into flesh and pull out body organs. Once more he took to taking home infant corpses to work on during the Spring break. His fellow students remembered that Herman’s fascination with dissection was unnatural and unnerving. Whether or not Herman participated in the ruse of faking someone’s death and using a substitute body to defraud an insurance company during this time is uncertain. In his very dubious autobiography, he claims that he and his medical student pals spoke of the idea, but never actually did it. And, given his penchant for self exaggeration, it is unlikely he would have been shy about revealing the fact. This certainly shocked the woman – but at least it wasn’t a dead baby under the bed! Never-the-less, the woman complained to the Medical School faculty, citing breach of promise. Herman appeared at a hearing and claimed the woman was lying and that he never promised to marry her. The faculty believed him and he was acquitted. A few months later, on being handed his graduation diploma, Herman approached his professor and said . . . Doctor, those things that woman said about me are true. There is something lurking in that man’s character that time will reveal. I do not like him. I firmly believe that he would commit murder. Herman also acquired a reputation as a swindler. He would use any number of excuses to get out of paying his rent. In the end he left Mooers Fork suddenly in the middle of the night to escape a mountain of debt. He even swindled the price of his train ticket to Chicago. In May of 1886, Herman turned up in Chicago. It was his intention to find work in a drug store, but he needed a pharmacy license to do so. He went to Springfield and sat a 3-day examination. It was subsequently announced in the press that Harry H. Holmes had passed the bar. 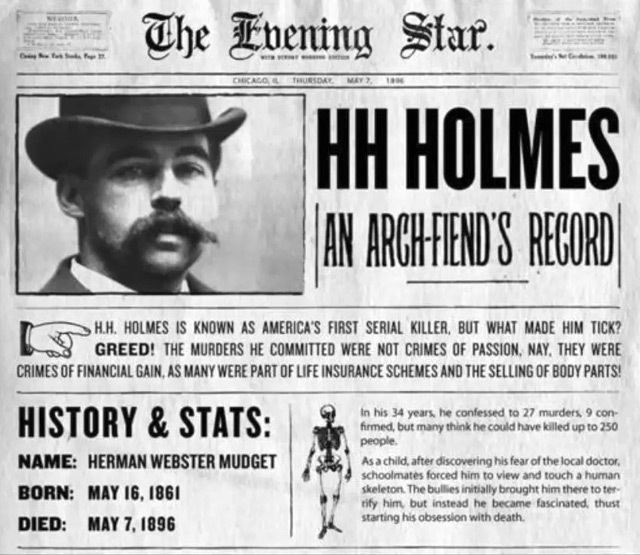 This announcement marked the first time that the Holmes alias was used. Why he chose to call himself Harry Howard Holmes is unknown – contrary to what many think it was not a nod to Sherlock Holmes; Conan Doyle’s most famous creation would not appear for another year. Holmes christened his new name by becoming a bigamist. On the way to Chicago he had spent time in Minneapolis, where he took up with, and then married, a young woman named Myrta Belknap. Myrta was rather plain looking, but her parents had money and that was enough for Holmes. Shortly after moving to Chicago, he used this wealth to purchase a parcel of land on what was then 701-703 Sixty-Third Street in Englewood. He had ownership put in his wife’s name, and then into that of her mother, in order to keep the creditors at bay. The Holmes mythology tells us that the bad doctor needled his way into the employ of a bed ridden pharmacist named E.S. Holton, whose young wife was run off her feet operating the business by herself. Holmes was hired to take over the operation and shortly thereafter the couple disappeared, with the implication that Holmes murdered them. The reality is that Dr. E. S. Holton was actually the wife. Her husband, rather than being on his deathbed, was a robust longshoreman. Dr. Holton took on Holmes and found him to be an ideal asset for the business. 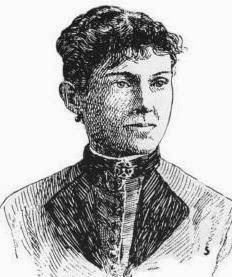 When she became pregnant with her second child in 1887, she decided to sell the pharmacy to Holmes. Rather than disappearing, the Holtons both lived well into the 20th Century, remaining in the same neighborhood that whole time. The pharmacy business became a great success, becoming especially popular with young women who came from afar to be served by the charming, handsome new doctor. Holmes began taking on assistants, invariably choosing nubile young beauties who were flocking to Chicago by the trainful. At the same time, Holmes turned his attention to the vacant lot he owned on the same street as the pharmacy. He planned to construct a two story building, with retail space on the first floor and residential apartments on the second. The building had some unusual features – there was a hidden compartment between the first and second floors, along with a staircase between floors that could only be reached from a trapdoor in the second-story bathroom. 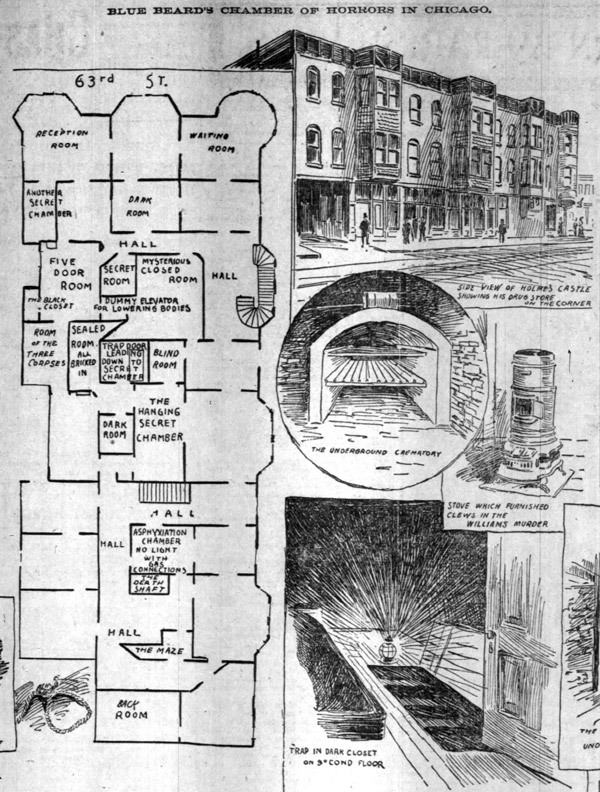 Murder Castle floor plan, crematory, stove and closet trap door. Far more troubling than these design quirks, however, was the fact Holmes refused to pay his bills. When the builders, Aetna Iron and Steel sued in 1888, Holmes claimed that he wasn’t liable because the building was actually owned by his mother-in-law. When the building company lawyers began to chronicle his involvement in the project, Holmes alleged that one of the steel beams provided was too short, which fact negated the entire contract. 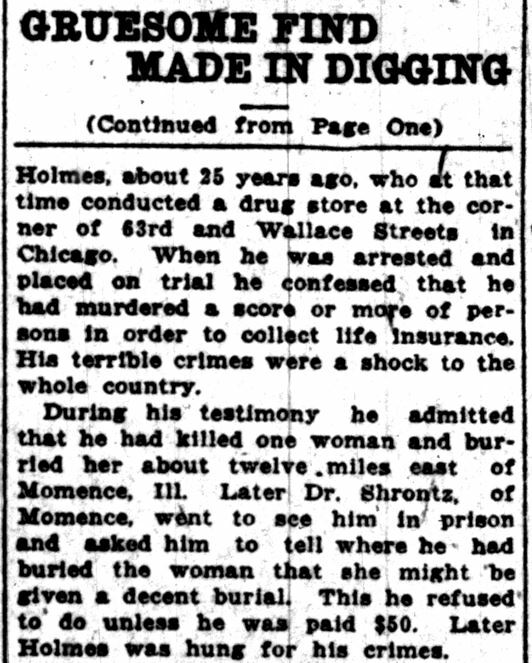 Defending himself in court did nothing to dampen Holmes’ passion for swindling. His favorite trick was buying goods on credit then selling them for cash and not paying the original bill. In one case he purchased an especially heavy safe on credit and had it installed on the first floor of his new building, having walls built around it. When the repossession agents came knocking, Holmes replied . . .
Go ahead and take the safe, but I warn you not to damage the building. The reposessors struggled for hours, finally realizing that they couldn’t get it out without tearing down a wall. They had to leave it where it was. The people who worked for Holmes soon got used to his quirky ways. He once invited a worker to step inside the safe and start yelling when Holmes closed the door to test if it was sound proof. His housekeeper would regularly catch him tip toeing round at night and the janitor who worked at the pharmacy recalled a time when Holmes showed him a collection of fake beards and other disguises. In 1890, Holmes decided to sell the drugstore business in order to focus on real estate. Unsurprisingly, the sale, turned into another swindle. After the new owner took possession, he was shocked to find that much of the floor stock had not been paid for, with repossession agents claiming them back. Still Holmes managed to talk his way out of trouble. In fact, even though he no longer owned the drugstore he still spent a lot of time there. He happened to be on hand one day when one of the new investors turned up with important information to share. The man inexplicably collapsed right outside the drugstore. Homes was the first one to his side, pouring a dark liquid down the man’s throat. Within minutes he was dead. This was the likely the first person to die at the hands of Dr. Holmes, killed because he knew too much about the mad medic. In July of 1889, Holmes employed a young couple, Ned and Julia Connor, who worked in the pharmacy and lived on the second floor of the recently completed Englewood building. Within a month, Holmes and Julia were engaged in a torrid affair, even as Myrtle lived under the same roof. This, understandably drove a wedge between the couple, with Ned filing for divorce and quitting Holmes’ employ. Julia now started to entangle herself in Holmes’ financial web. He listed her as the co-founder of a number of businesses and took out numerous debts in her name. Then, on July 4th 1891, Julia and her eight-year old daughter Pearl disappeared off the face of the earth. The bodies were never discovered and Holmes never confessed to murdering them, but it seems quite likely that they were the next victims of the deadly doctor. Around this time, Holmes started a completely new business, the Warner Glass-bending Company. Though he actually knew nothing about glass bending, he convinced those who would listen that he had invented a unique glass bending technique. To perfect it he’d built a furnace in the basement of his two story building and made a great show of setting to work, though no one actually saw him bend any glass. She’s gone to Europe to get married. By the end of 1892, the whole city of Chicago was abuzz with the prospect of the approaching World’s Fair in celebration of the 400th anniversary of Columbus’ landing on the Americas. Never one to pass up an opportunity, Holmes quickly had a third story put onto his building to serve as a hotel. However, he never really intended to use the floor as a hotel. The amount Holmes could make renting out rooms was small potatoes compared with what he could make by convincing others that he was opening a hotel. With such a venture in the works, he could raise money from investors who’d never see a penny back. He could also buy up innumerable goods on credit to sell without paying for them and, as a final windfall, make thousands in insurance money by setting fire to the building. Despite the popular notion that the Holmes hotel was flourishing during the World’s Fair, luring countless women to their death, there are no records that he even took in a single paying customer. When he set the structure ablaze on August 13th, 1893, to claim the insurance, the only people on site were long term residents. The resulting claim would spend years going through the courts, by which time the claimant would be behind bars. With mounting law suits, Holmes decided that it was time to quit Chicago. His travels took him to Denver, Fort Worth, Texas, St. Louis and, finally Philadelphia. Along the way he got himself married once more, this time to a 23-year old with a two-thousand dollar inheritance. He also fell in with a like minded swindler by the name of Benjamin Pietzel. Pietzel got himself thrown in jail for passing bad checks and while he was inside, Holmes began paying the premiums on his life insurance policy. When he got out, the two joined forces and purchased a vacant lot in Fort Worth. Here they set about building a replica of the complex that Holmes had built then burnt to the ground in Chicago. Just like the original building, the Texas hotel featured a number of strange passages and twists. But just what Holmes planned to do with the building is unclear. He didn’t hang round long enough to use it. What he and Pietzel did do was to take out tens of thousands of dollars in mortgages on it, and then disappear without making more than a couple of token payments. The two moved on to St. Louis where Holmes bought a drug store for a down payment of $50 and promissory notes that were completely worthless. Pietzel then approached a drugstore supplier and convinced them that he was interested in buying the drugstore from Holmes. If they lent him the money, he would use them as his main supplier. They agreed. This swindle came unstuck when the drugstore’s rep called in the next day, only to find the place shuttered up. He got suspicious and called in the authorities. Holmes was arrested and spent three days in jail. On his release, Holmes headed for Philadelphia and the swindle that would prove his undoing. Here he planned to make good on those insurance premiums he’d paid for Pietzel a few months back. The two men had long been scheming to defraud the Fidelity Mutual Insurance Company by faking Pietzel’s death and splitting the proceeds. In early September, however, Peitzel got cold feet and wanted to back out. An unhappy Holmes agreed to meet up the next day to further discuss the issue. When he turned up at Pietzel’s address, Holmes proceeded to get him drunk. Then he knocked him out with a cholorform handkerchief, increasing the dosage until his old friend was dead. 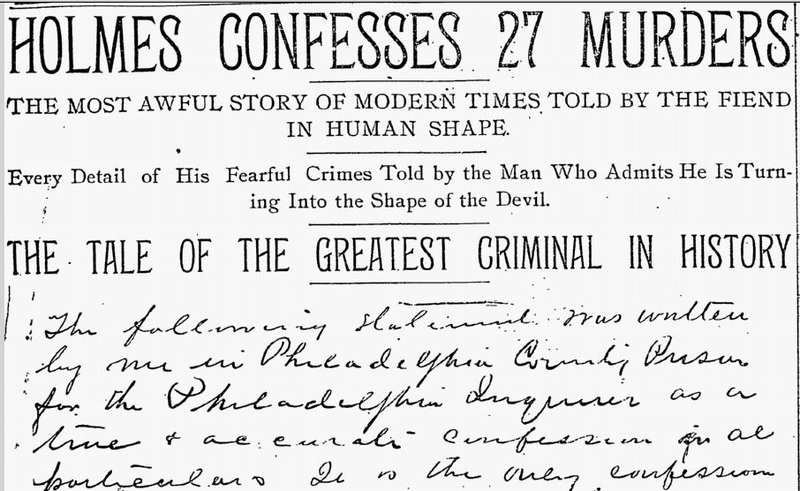 HH Holmes confesses to 27 murders. Holmes then attempted to stage the scene to make it look like an accident. Then, with his 23-year old wife in tow, he jumped on a train for Indianapolis, intent on securing the $10,000 insurance payout. In the end the payout was made to Pietzel’s widow but Holmes convinced her that her husband had died owing him $7,500 for the Texas building. She handed the money over. As an act of graciousness, Holmes agreed to accompany the three Pietzel children to Indianapolis where they were to stay with their aunt. Before he could deliver them, however, he discovered that he was a wanted man. Authorities from a number of states, including Philadelphia, were keen to talk to him. Now officially on the run, he moved the children all over the countryside. At some point, he decided that the children would have to die. The youngest, eight-year old Howard, was poisoned with cyanide, while the two girls were likely gassed to death. The bodies were buried in a cellar. By now detectives were hot on Holmes’ trail. They finally caught up with him in Boston and, of all things, arrested him for horse theft. A raft of further charges followed and in October, 1895, he was convicted of murdering Benjamin Pietzel. Holmes subsequently confessed to 27 murders and was hanged on May 7, 1896. His dying wish was for his body to be buried under ten feet of concrete to prevent grave robbers from stealing and dissecting his body – a luxury he denied many of his victims.